Louisa Fleet Recruitment : Review meetings: waste of time or great source of knowledge? Review meetings: waste of time or great source of knowledge? It is often said that communication is key and this is certainly true in the workplace. Why then do so many people see the review meeting as a complete waste of time, often overlooked and rushed? As an employee, I find the review meeting is an essential part of my working life. In fact, I’m an employee who is lucky enough to have an employer who is very open about business life, and I can see that review meetings are also essential to progressing in business as well! Yes review meetings can seem like another hoop to jump through, another box ticking exercise, but actually I think that review meetings can be extremely valuable. In a time where we are all busy, with targets to meet and people to keep happy, the last thing we often feel like doing is another review meeting. As an employee it can feel like a box ticking exercise and can take you away from other tasks that seem more important. As an employer, it can feel like yet another meeting in a week full of meetings and you are probably aware that the employee is equally frustrated. To help both parties see the value in review meetings, it is important that we make these great opportunities to gain knowledge. Here are my thoughts from an employee’s perspective for making sure review meetings are a great source of knowledge instead of a waste of time! Great source of knowledge – how are things going? How will you ever have a chance to tell your employer how things are going for you without a specific time to share your thoughts? It might seem like you can do this over a simple, informal coffee break, but you could be waiting weeks for the ‘right moment’ to appear, and by then it might be too late! A review meeting is a great opportunity to set aside time for a one-on-one meeting with your boss where you can give them an idea of what you really think about your job and work environment. What do you like about your job? What do you find more challenging? What support or tools could you do with to help you do your job even better? These are all things that are difficult to talk about if you haven’t put aside the time to do so … trust me, I’ve been there many times! My tip to make this part really great? Get your thinking hat on before the meeting! Hopefully your boss will send you something to think about before the meeting – maybe some questions for you to answer and send back before you meet. Don’t brush this to one side and forget to complete it. Take it seriously and answer honestly. Then you can talk about your answers in the meeting. If you are open and honest, you are more likely to find the review meeting useful. You might even learn something about your boss too – this is a great way to find out if they are thinking along the same lines as you! Waste of time? I don’t think so. I want to let my employer know honestly how things are going – this is the only way she will know how I feel and if there are things that need to improve then it’s better to talk about them than pretend they’re not there! Have you been given targets to work towards? If so, have an idea of how you think you are performing against them. Your boss will certainly have an idea and this is a good chance to talk about them. How do you feel about your targets? Are they unrealistic? Too easy? Hopefully you’ll learn how your employer feels you are doing and they will tell you from their point of view what your strengths and points for improvement are. And hopefully you’ll both agree! This is also a great chance to talk about where you want to progress to and where your employer wants you to progress to. Make sure you understand your targets and the value in them – it can feel a bit one-sided if this part of the meeting is all about the employer’s needs – a great review meeting considers you both – targets to benefit the business as well as your career development as a whole. Make sure you look back at your targets from the previous meeting as well – if goals are set and then not reviewed at the next meeting it can definitely seem like the meeting was a waste of time! Don’t leave it all to your boss though – if they forget to mention the target from before, be proactive and bring them with you to talk about. Waste of time? Not for me. I want to be re-energised and motivated to achieve even more, and a good review meeting helps me to do just that! This can only be a win-win. I get a renewed sense of happiness in my job and I benefit my employer by being even more motivated to help the business grow! As employees, if we are really engaged with the business, we often have some great ideas for how to do things differently or how to improve things. For an employer, that’s great! They want to hear your ideas! Who wouldn’t want to improve their company environment or processes to benefit the business? Make sure you bring your new ideas to the table – even if you think they’re obvious – your employer may not have thought of them. Waste of time? No. Sharing ideas in business is great – we all have different ideas –this is valuable. Absolutely not a waste of time! My view? Valuable, helpful review meetings are not a waste of time – for employee or employer. Regular review meetings, done well, can be a great time of discussion and progress. Although I agree if they are rearranged a hundred times and are rushed or have a lack of structure, then they can seem like a waste of time. A well planned, regular, structured review meeting doesn’t even need to be lengthy – they can be focused and useful! My advice as an employee? Prioritise these meetings. If your boss seems to have forgotten, maybe a little nudge to make sure they remember to send you the plan before hand. If your boss doesn’t place high value on review meetings yet, I’m sure they will soon realise that when you feel happy, listened to and are invested in the company, then they will see great results! 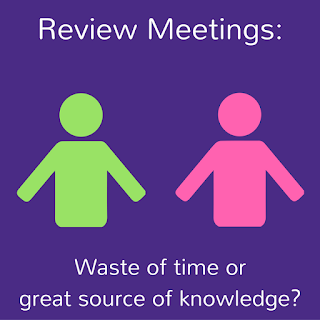 So, review meetings – waste of time or great source of knowledge? I hope if you thought these were a waste of time at the beginning that I’ve now managed to change your mind and you can now see that review meetings can be the greatest source of knowledge, for employee as well as employer. We are a team of motivated professionals who are keen to help you find your next sales role! Please get in touch with us if you are looking for your next step in the sales world – info@louisafleet.co.uk or call me directly on 07949 355945 and I’ll be happy to help! You can also find us on Facebook, LinkedIn and Twitter – follow us to keep up with our latest news and vacancies.